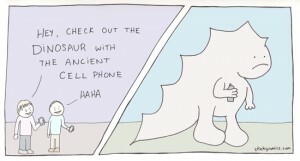 What do keyword mCommerce Search & Dinosaurs have in common? It’s a pretty good analogy, really. If we set the way-back machine to 2007, there was no mCommerce (eCommerce on a mobile device). Why? Because the mobile devices of the day were not designed to be the computer-in-a-pocket devices that we have today. The very best options in those days were slick flip-phones (like the Razr, I still have a red one sitting in a drawer), PDA’s that doubled as phones (like the Palm Treo my boss had) and, of course, the Blackberry. In the same universe, eCommerce searches, like all searches, were based on keywords. We were all trained to search in terse terms, knowing that the search engine was not intuitive and could not understand the intent or context of the words we use in normal, everyday language. So we searched based on one or two words and then used navigation to drill down to find what we were really looking for. I don’t need to tell you how smart your smartphone really is – you already know that. With the advent of voice technology like Siri and GoogleNow, the next big game changer came in the form of smarter search. We now have the ability to speak to our smartphone the way we speak to another person. For example, if I’m in Boston’s famous North End and I want pizza, I can ask for the best pizza in the North End and get a list of shops – with recommendations. How cool is that? But what about mCommerce? Here’s a world where search is critical. After all, any shopper coming to your site has the potential to become a buyer. If they found what they were looking for on their first search, there’s a better chance of delighting them and converting them into a buyer. So, if I want to buy a blue dress, I ask for a blue dress, and if I want that dress in a size 6 for less than $100, then I ask for a blue dress in a size six under $100. Here’s the interesting part, most of the technology that is used to search in eCommerce still uses keywords. Those engines will pick apart my query and return things that have nothing to do with what I asked for. I’ll get lots of blue things, and I’ll get underwear and I’ll even get a message telling me that they can’t find any matches (the dreaded no results page) or worse yet, I will get 10,000 items that are all wrong. But, there are some technologies available today that understand the true context of my question, and will return results that exactly match what I asked for in the first place. It’s funny because Google, Bing, Yahoo and IBM’s Watson all use this new natural language technology for their searches, but in the eCommerce world, the obsolete keyword search model still pervades the market. Why? Because it is free and it is embedded in the eCommerce platforms and many eRetailers don’t even know that a better way exists. If you are an eRetailer you must be asking yourself if a natural language search engine would give you a competitive edge, delight your customers and drive your revenue. The answer is, of course! When your business is relying on returning the right products, the first time, don’t give it to the dinosaur. Because what do dinosaurs and keyword search have in common? They are both extinct.